I was surrounded with quilts from an early age. My grandmother, aunts and my mother all quilted – mostly of necessity, since they were all farm wives in southern Illinois. My initiation to the art form was threading needles during their quilting bees. Sewing has been a part of my life starting with my first “feed sack” skirt and continuing through my home economics education and long time teaching career. My first quilt however was made nearly forty years ago when our son was born. 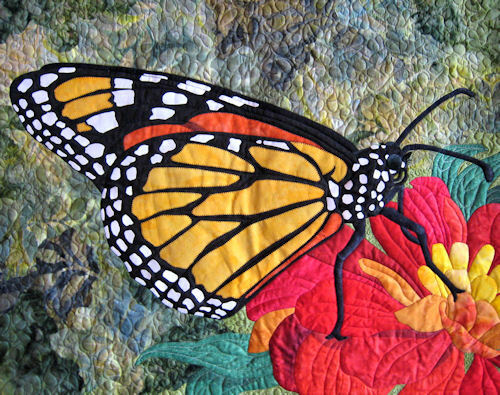 In 2008 three things converged to forever change the focus of my quilting; a digital camera, Solvron®, and an article in the Quilting Arts magazine. 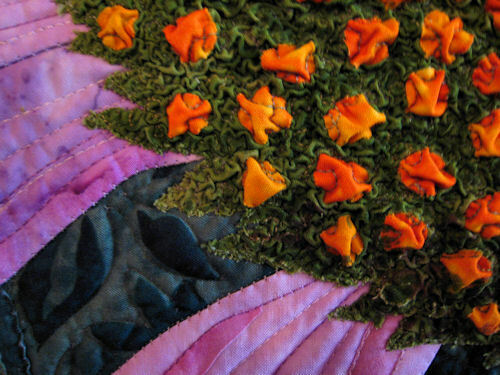 The camera took great close-ups of flowers that I longed to turn into quilts. In a quilt shop I discovered Solvron®, a water-soluble material used to give fabric interesting textural effects – I’m seeing possibilities here! And the article gave me the final piece of the puzzle showing me how to turn my pictures into a pattern. 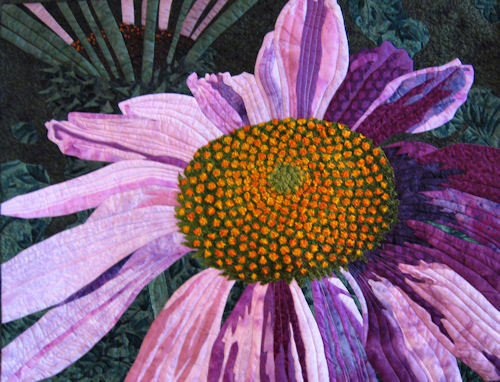 I was hardly finished with my first piece, Brown-Eyed Susan, when I found myself totally obsessed. 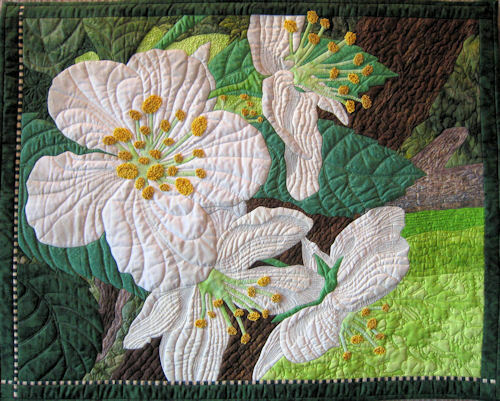 In the quilt world my work is classified as machine appliqué. It is based on photos that are manipulated in the computer to create a master pattern and pattern templates. Most of the fabric pieces are cut with a seam allowance that is turned under and the pieces are then assembled like a jigsaw puzzle. When the piece meets my approval the sewing/quilting begins. “Mother Nature” is the artist in my work – she has created the form and chosen the colors. I am the interpreter. I honor her by trying to be as true as possible to the original photo.